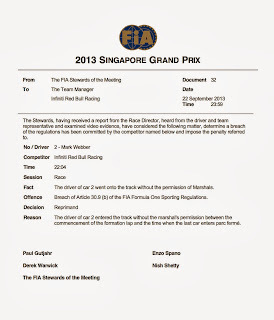 The FIA handed official reprimands to both Fernando Alonso and Mark Webber after the race in Singapore. Why? Because Alonso stopped to give Webber a lift after the australian's engine gave up the ghost on the last lap and Webber went onto the track without permission from the marshals. 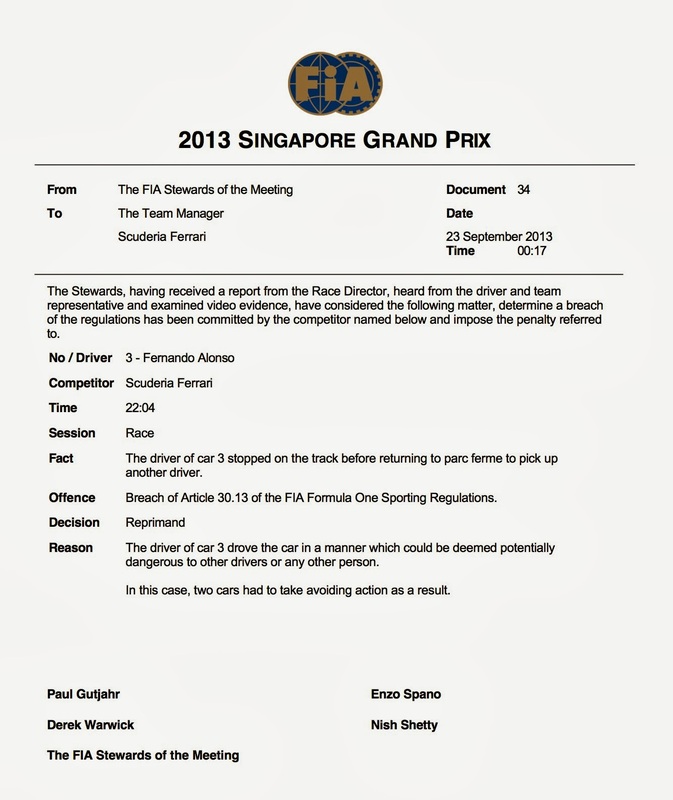 For Webber, this being his third reprimand of the season, it means an automatic ten spot penalty in Korea in two weeks. Well played FIA, well played. Perhaps fans are booing the wrong person. This idea of "Hey kid can I bum a ride?" on the last lap of a GP is incredibly dangerous. I understand that in an effort to avoid being bum-rushed by the fans these drivers want to get back to the safety pf the pits as quickly as possible, but doing it a la Senna Mansell is no the way to do it. Do to Webber jamming his foot straight into Alonso's groin, Alonso's field of vision is completely blocked on his left side. Not too bright. Alonso cant see half the track. Webber should have hopped on Lone Ranger rodeo style like Alesi Schumacher or Fisichella Schumacher. I remember years ago Webber used to have a pineapple painted in the top of the helment, maybe this weekend in Singapore he had a pineapple for a brain. Every race that Seb pulls further away from Alonso after the race I go straight to YouTube and play Abba's "Fernando". Once again, the little Spaniard comes up short. Guess F1 was upset that NASCAR was the idiotic racing series of the moment. What I see here is good sportsmanship. You race hard, race ends, and you treat you fellow drivers with the same respect they show you. Stay classy guys! The smart thing for Webber to do was to wait for the marshal's car so he could get a proper ride back to the paddock. The problem with riding on the side is the guy driving cant fully see where's he's going. Its not really that the driver cant see where he's going, its that with only half his vision, he cant see if someone runs out in front of him. If he were to hit a spectator running onto the circuit or clip a marshal the promoter could be sued, the FIA could be sued etc. Its for legal purposes that they don't want the driver to give rides at all. As everyone knows at the end of a race its a custom to make a trek to the podium and then walk the circuit. Frenzied fans can overcome the barriers pretty quickly. They don't want anyone to get hurt...or most importantly sued. And I don't question Alonso's talent. Its just that Seb's talent, I think, is just a little bit more. I think Alonso is this generations Prost and Seb would be Senna. Clearly, these days Alonso is "The Peoples Champion", but that's because he's at Ferrari and people are getting tired of Seb winning everything. If Alonso were at Red Bul, McLaren, or Lotus I don't think he'd get as much fan support. I don't mean to insult Alonso, its just a childish way to joke about him. Kind of like the way Alonso is 32 years old and one of his hobbies is collecting those little plastic Japanese anime figures. Jeez. To me, that's a let down. That's like discovering that Jimmy Hendrix prefered to play air-guitar to someone else's music instead of his real guitar to his music. Besides I think Alonso misfortune over that last few years is largely do to bad karma from his Renault, Singapore, little Piquet incident from Singapore '08. Briatore had been his manager for years. They were together like peas and carrots. Alonso was in on it. If he didn't know about it before the race, he should have been man enough to forfeit his win after the race. This must be your first F1 race? Either that or you only watch the NBC and Speed coverage of F1. As much of a dictator Jean-Marie Balestre was, he never penalized the drivers for being good sportsman. OMG Mansell, look out for that cameraman! (Nice new design!) At first I thought the same about the penalty. However after seeing this video, one can understand why the penalty was handed. Actually I though it was stupid too but then I saw the video: http://www.youtube.com/watch?feature=player_embedded&v=IBByzQBCSXE right on track and in the racing line. Despite not racing, there were cars passing on both sides. Sorry mate. Well deserved this time. Actually I though it was stupid, then I saw the video: http://www.youtube.com/watch?feature=player_embedded&v=IBByzQBCSXE right on track and in the racing line. Despite not racing, there were cars passing on both sides. Sorry mate. Well deserved this time. A 10 place grid drop is extreme, but actually they both just received a reprimand which is appropriate (Alonso for stopping on the racing line, Webber for re-entering the track). Unfortunately this was Webber's 3rd reprimand of the season, earning him the 10 place grid drop. It's very simple had Alonso pulled off the track in the run off area then there wouldn't have been a penalty for either guy. What they both did is reprehensible. They still only got slaps on the wrist but since it's Webber's 3rd such slap on the wrist he gets an automatic 10 grid penalty. The FIA had nothing to do with it. Had webber not have 2 previous reprimands this would be a non issue. Yeah, the new video seems to show the reprimand was deserved. Dumb move with good intent. What do Mark Webber and The Honey Badger have in common? SMH. While I get that Alonso's stop was fairly dangerous, at the end of a race ALL the track marshals run out onto the pavement to clap and wave flags, etc etc. Therefore I believe that all this jazzed-up nonsense is fairly inflated since the drivers all know they must be watching out for pedestrians - be they track workers or the errant fan who may have found a way around the barriers. 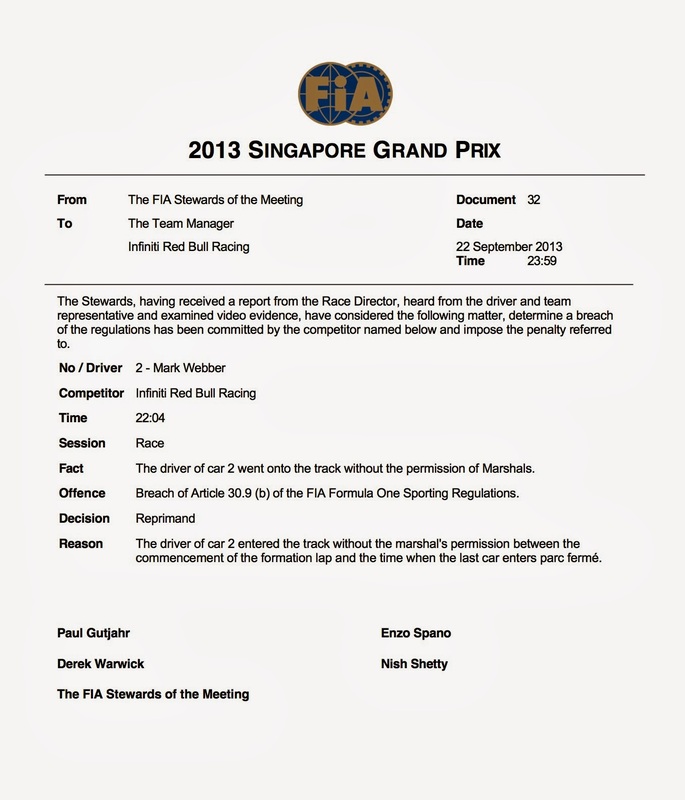 Giving Webber a 10-spot penalty is beyond absurd, despite his apparent previous infractions. This effort, while somewhat dangerous for both competitors, is the EPITOME of good sportsmanship and, I believe, a very important concession given the other post-race controversy: That of the crowd booing, once again, Sebastion and that blasted finger. We NEED competitors making such overt gestures to their opponents, as otherwise we'd end up with very passionate fans thinking that some on-track malediction is justification for rude and violent behavior. One only needs to read the headlines after a (euro)football match or grandstand scuffles between NASCAR fans, and recently in the US several murders and assaults exchanged between baseball and football team fans. SOME measure of criticism is warranted here, but less than a punishment-warranting reprimand, perhaps something more like a warning. You can't punish what is fundamentally a sporting gesture, in sport... Flexibility is a mark of intelligence. I'd say the 3 strike rule is the problem. 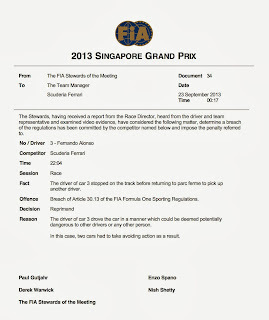 General idea is all wrong IMO (aka Grosjean rule).